As with any breed, situations arise when a BGV needs to be re-homed. This may be due to changes to the owner's personal circumstances such as illness, separation, moving home (even overseas), or bereavement. Whatever the problem, it is important that owners know we are able to offer immediate support and care and, where suitable, agree to find a new home for the BGV or, in some cases, the BGVs. through no fault of their own, are no longer able to stay with their owners. The Club's Welfare and Rescue Co-ordinator is there to help you. The Wefare and Rescue Co-ordinator is supported by a team who make joint decisions to ensure the well-being of the BGV and provide help when needed. Every effort is made to place a BGV in a suitable home as quickly as possible to avoid upset in routine for the dog. On entering into the Club's rescue scheme, all BGVs are checked for a microchip. These are registered immediately against the BGV Club's Welfare & Rescue Co-ordinator. Any not already micro-chipped will be done so by the BGV Club and also registered against the Welfare & Rescue Co-ordinator. Once re-homed registration will be transferred to the new owner. Any BGV taken in by the Club will be checked by a vet and, where necessary, treatment undertaken. 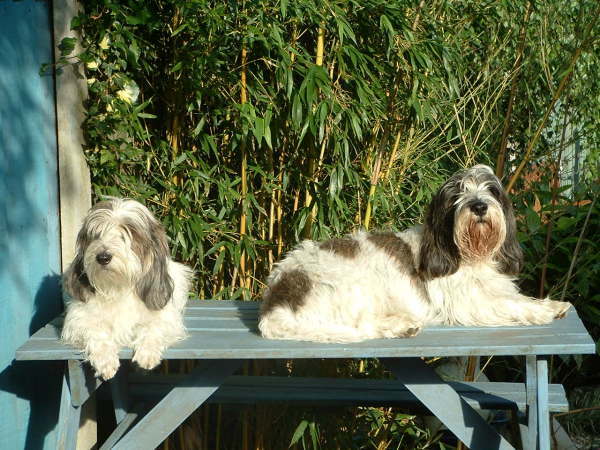 As we know there is an incidence of Primary Open Angle Glaucoma in PBGVs, the conditon of any PBGV's eyes will be established before rehoming. The BGV Club will organise DNA testing where required. 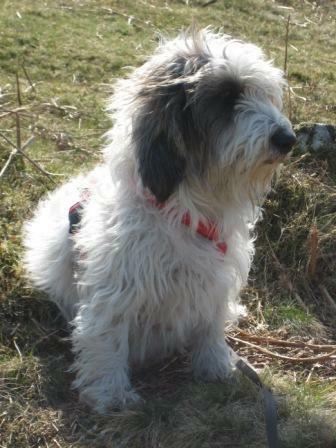 Any PBGV found to be affected by the disease will be eye tested to see whether medication is needed and will be rehomed with written advice from the Health Sub-Committee. hounds that even when they are old the sense of smell overtakes everything else! She's a little more fussy eating now and likes a change now and again. We have cut her walking down and vary it depending on her joints, especially her back legs, which occasionally give way if she takes off too fast. heart murmur that had worsened a little but was still within non medication ratios. We do worry about her and some nights I look at her in her bed and think oh gosh she's not breathing and then have to prod her gently to make sure all is well. What a joy she has been in our lives". MARCH 2017 "Our dear old Felicity died in the middle of last month, six weeks short of her 16th birthday. She was a super, lovely girl. We were lucky to have had her for so many years". Our Code of Practice: In 2006, to ensure high standards for our Welfare and Rescue arrangements, the Club implemented a Code of Practice with a Trustee/Rescue Co-ordinator with two additional Trustees. These people are collectively responsible for decisions made for the welfare of any BGVs needing our help. Our Aim: Our goal is to never have a dog in our rescue kennels. With careful management and placing of dogs into the correct homes, we can achieve this. If we do take a BGV into our care, it will receive both our attention and that of a vet. We also ensure good feeding, grooming, health and contentment before the BGV goes to its new home. We aim to do this as quickly as possible to minimise distress for all involved and to ensure that the BGV is able to settle quickly. How the Club raises funds to help: The Basset Griffon Vendéen Welfare & Rescue is financed by the Club's monthly Limited Odds Draw, donations and fund raising events. For the Limited Odds Draw, each participant contributes £12 a year and is allocated a number. Each month a draw takes place and three numbers are selected. If the participant's number is chosen, a cash prize is won. The profit from this goes to the Welfare & Resccue fund. For further details of the LOD, go to our Membership page or contact Geraldine Dodd on 01582 865828. Another way that the Club raises money is to hold regional fun days and other get-togethers during the year. 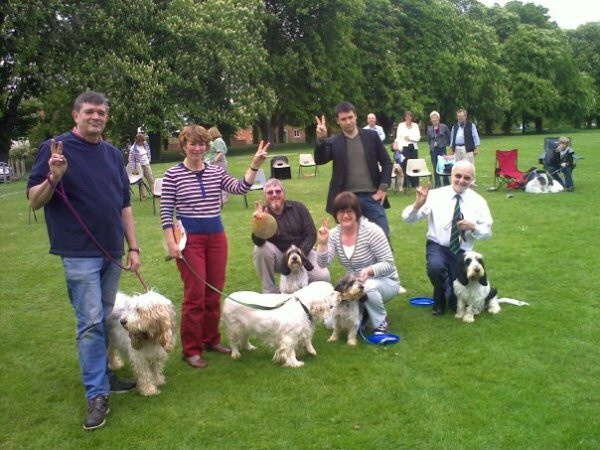 These are always highly enjoyable, giving pet owners and especially those who own rescued BGVs the opportunity to meet others with the same breed. If you think you could give a rescued BGV a good home, we would like to hear from you. Please give us your details by completing the form here.